Exmasters Review 2019: Is Exmasters a Good Hosting? Exmasters is a web hosting company targeting the adult entertainment industry. They offer unlimited domains and subdomains along with features that will help you grow your adult website or business. Adult websites are a tricky business. It is often difficult to find quality hosting at a reasonable price. That’s where Exmasters comes in. They have been providing quality adult web hosting since 2001 and offer a wide variety of plans for adult sites of all types. Exmasters offers a fully-functional web hosting environment that can handle almost any adult site. Regardless of which plan you choose, you’ll get the same primary and advanced features. This site isn’t for the rank beginner. While their web control panel and online apps are straightforward, you need to know what you’re doing. There are no pre-configured designs or point and click website builders. This host is geared towards adult web hosting, so it isn’t necessarily ideal for newbies wanting to start up a blog unless it is an adult blog. There are ten different plans for which you can register, and all have the same features except for storage, bandwidth and the number of MySQL databases supported. Below is a brief overview of the plans. 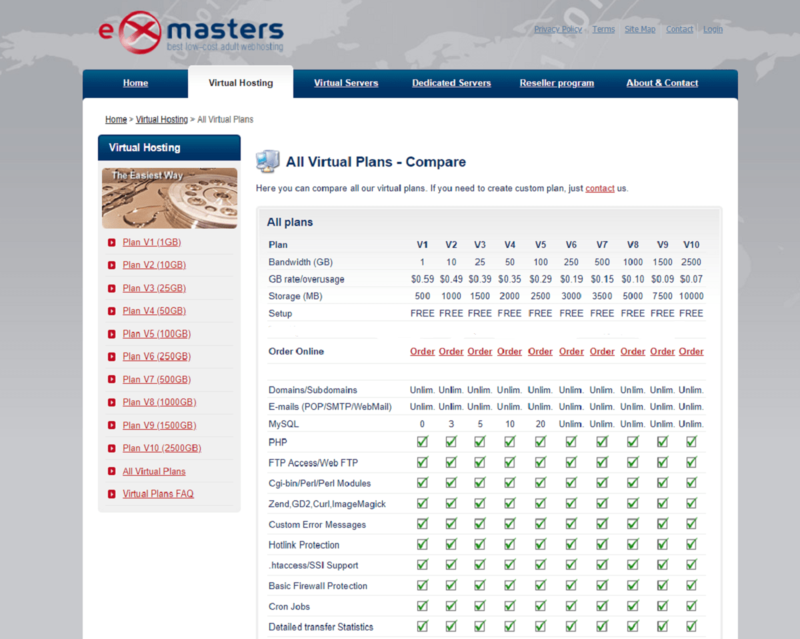 Exmasters does not offer a free plan. You can request limited free access to conduct testing of their servers, but it will not be adequate to host a site. The first couple of plans are limited in storage space and bandwidth. Sites requiring a lot of bandwidth, such as those hosting video libraries, will need one of the larger plans. On a positive note, if you happen to go over your data cap, your site will not be shut down – instead, you will pay overage fees. You can always upgrade or downgrade your plan at any time at no charge. If you find that you’re regularly being hit with overages, an upgrade is probably needed. Exmasters has solid 24/7 customer support and offers live chat, phone, and email support. You can even reach them on Skype and ICQ. Yes, there are still those out there using ICQ. I found their customer support very knowledgeable and was able to speak to an agent almost immediately. Also, in cases of emergency, such as a downed server, they offer an emergency email contact that claims to fix problems within 10 minutes. If you’re looking for adult hosting, Exmasters is definitely a site that should be on your short list. They offer plan flexibility and the features necessary to handle adult sites of all sizes. Wondering how Exmasters stacks up against other Web Hosting companies? Enter any other Web Hosting company and we will give you a side-by-side comparison.